Infused. Arnica has been a significantly important plant throughout Europe since the 15th century, and it is still highly popular in herbal medicine today. 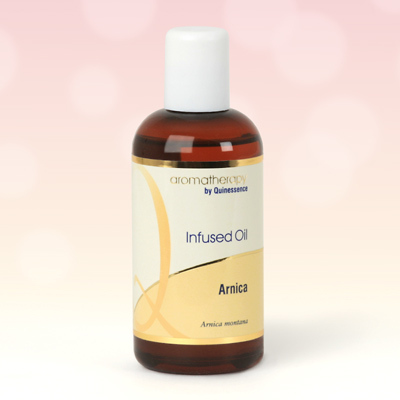 Due to its amazing therapeutic properties, arnica oil has now become popular with aromatherapists as well. Quinessence Arnica Oil is produced by macerating the flowers of Arnica montana in organic sunflower oil which is rich in vitamin E. This versatile infused oil can be used either on its own or blended with another carrier oil for massage, and of course suitable essential oils can be added to arnica to produce a really powerful treatment. Arnica oil is invaluable when treating bruises, sprains, pulled muscles, torn ligaments, and in fact all types of sports injuries. Arnica oil works best when applied quickly to injuries, and many athletes apply arnica oil before and after sports to help keep any possible damage and inflammation due to injuries to a minimum. Do not apply Arnica Oil to broken or damaged skin since it may cause irritation for people with sensitive skin.